This handbook presents a discussion about what is wrong in the economic system, according to the Populist perspective. It was written by P. B. Maxson and J. C. Hebbard, both Kansans, who were active in the Alliance and Populist causes. It deals primarily with financial issues, but contains some information on the price of crops, railroads, etc. This pamphlet recounts the rise of the Populist Party in Kansas and the events of the legislative war in Topeka. This history is written from the Populist perspective. It may have been written by William Henry Kent who died in 1916. A portrait of Annie (Le Porte) Diggs, who was born in 1848 in Canada to an American mother and French father. Two years later the family moved to New Jersey, where she attended school. Diggs moved to Lawrence, Kansas, in 1873 and married Alvin S. Diggs shortly thereafter. While in Kansas, Diggs began to attend the local Unitarian Church and developed a strong sense of moral responsibility that prompted her to work for temperance and women's suffrage. During 1882, Diggs and her husband published the newspaper Kansas Liberal, and beginning in 1890 she was the associate editor of the Alliance Advocate. As a radical reformer seeking to wipe out injustice, Diggs also allied herself with the Farmer's Alliance, aiding in the creation of the People's (Populist) Party, serving on the Populist National Committee, and supporting the fusion of the Populist and Democratic parties in the 1898 election. 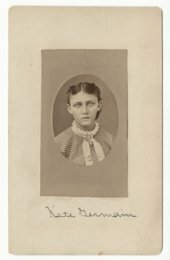 Throughout this time she continued to work actively for women's voting rights and served in the Kansas Equal Suffrage Association. In 1898, she was appointed the state librarian of Kansas, and she was also elected president of Kansas Press Women in 1905. Diggs moved to New York City in 1906, where she worked on two publications: The Story of Jerry Simpson (1908) and Bedrock (1912). She relocated to Detroit, Michigan, in 1912 and died there on September 7, 1916. This political cartoon drawn by Bernard Gilliam was copied from the satirical magazine Judge presents the Republican perception of the People's (Populist) Party. The artist depicts the People's Party as a hot air balloon made up of a patchwork of pieces, with each piece labeled with the name of the political organization or party that has been subsumed under the banner of the Populists. Some of the more recognizable "patches" include the Prohibition Party, the Greenback Party, the Farmer's Alliance, and the Knights of Labor Party. Inside the balloon's basket are two leading Populists from Kansas, William Peffer and "Sockless" Jerry Simpson. Arthur Capper, United States senator from Kansas, Charles Curtis, vice president of the United States, and John W. Thomas, United States senator from Idaho, in Washington, D. C., are photographed with 4-H Club members from Kansas. Capper, 1865-1951, a native of Garnett, Kansas, served Kansas as Governor from 1915 to 1919, and U. S. Senator from 1919 to 1949. An informal portrait of Kansas Senator Arthur Capper, 1865-1951, displaying his Capper Clubs banners and county booster pennants in his office in Topeka, Kansas. Capper, a native of Garnett, Kansas, served Kansas as Governor, 1915-1919, and as U. S. Senator, 1919-1949. This black and white photograph shows the labels for the Atomic Basic Chemicals Corporation and the Farmers Co-Op of Lyndon, Kansas. Silver baseball trophy awarded to the Kaw Valley baseball club of Lawrence, Kansas, during a baseball tournament held at the Third Annual Kansas State Fair in Lawrence in 1867. The Executive Committee of the State Agricultural Society commissioned the trophy. Teams in the competition included the Shawnee Club of Topeka, the Kaw Valley Club of Lawrence, and the University Club of Lawrence. This is the Brand Book containing the brands of the Western Kansas Cattle Growers' Association authorized by the Stockmen's Convention, held at Dodge City, Kansas on April 2, 1884. In addition to the brands, the book contains proceedings of the convention, officers, and an index to brands. This is the Brand Book containing the brands of the Western Kansas Cattle Growers' Association. It was authorized by the Stockmen's Convention, held at Dodge City, Kansas. In addition to the brands, the book contains proceeedings of the convention and and listings of officers. This photograph shows the booth constructed by the Butler County Farm Bureau as a display for the Kaffir Corn Carnival in El Dorado. This publication was funded in part by the National Historical Publications and Records Commission through the Kansas State Historical Records Advisory Board. A poster for the Cherokee County fair. There is no year given but the dates are from October 11th to October 14th. Highlights of the fair include: $2,500 in premiums; good races daily; and shows of mechanical arts. Fair officers are A. T. Lea, president, and D. C. Nichols, secretary. This is a photograph of the Cimarron Co-op Exchange elevator in Cimarron, Kansas. This is a photograph of the Co-op Exchange elevator in Cimarron, Kansas. This poster announces the first annual fair of the Cherokee County Breeders' Association to be held in Columbus, Kansas. Highlights of the fair include $3,000 in premiums, first class exhibitions, and a good band. Fair officers are A. D. Watts, president; Henry Neal, vice president; Dr. E. A. Scammon, treasurer; and L. M. Pickering, secretary. Constitution of the Alliance Produce Co. The Alliance Produce Company was formed "to secure the laborer a more just and equitable share in the product of his labor." The company intended to assist in marketing products, making loans for homes and equipment for pursuing a trade, and providing credit. The company was headquartered in Topeka, Kansas, and the president was P. B. Maxson of Emporia, Kansas. The board of directors included men from various Kansas communities. This company was viewed as part of the Farmers Alliance and Populist movements that believed that economic and governmental practices favored banks, railroads, and large companies at the expense of the laborer. It apparently intended to assist laborers by providing affordable credit. A fair poster advertising livestock and bicycle, foot, and horse racing as well as musical entertainment events as part of the fourth annual fair of the Cowley County Fair and Driving Park Association at Winfield, Kansas. Fair officers are S. P. Strong, Rock, Kansas, president; W. J. Wilson, Winfield, Kansas, secretary; and A. H. Doane, Winfield, treasurer. The same artwork is used for the Crawford County Fair poster in Girard, Kansas, for 1887 (item 210473). A poster advertising livestock, horse racing, and entertainment events for the fourteenth annual exhibition of the Crawford County Fair Agricultural Society in Girard, Kansas. The same artwork is used for the Cowley County Fair poster in Winfield, Kansas, for 1886 (item 210470). This poster announces a fair at Ottawa, Kansas, sponsored by the Franklin County Agricultural Society. Highlights of the fair include $3,000 in premiums, racing, and good track. The poster includes color illustrations of livestock, farm machinery, and sulky racing. This poster announces a fair to be held at La Cygne, Kansas, sponsored by the Linn County Agricultural Society. Highlights of the fair include $900 in premiums, all entrees free, and trial of speed each day.